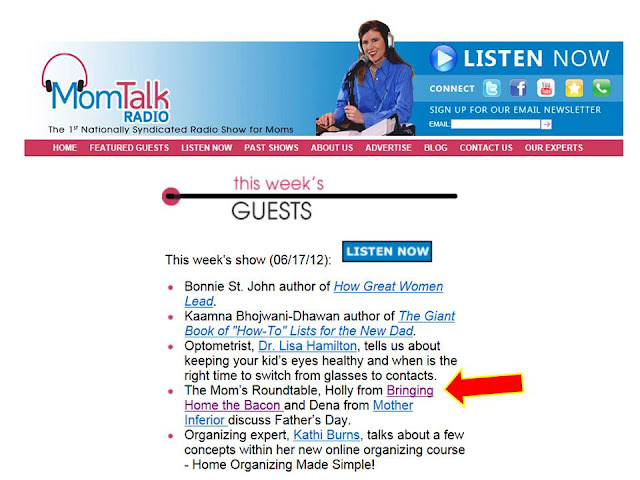 Last week I taped a MomTalk Radio Father's Day show with the legendary Maria Bailey. How did that happen? I don't really know. Totally out of the blue I got an email from her assistant Carey asking if I wanted to do the show. I have been receiving the MomTalk emails for some time now, so I guess my number just came up. I wanted to be prepared so I went to the website and listened to a few back episodes--all very good and very informative for Moms. 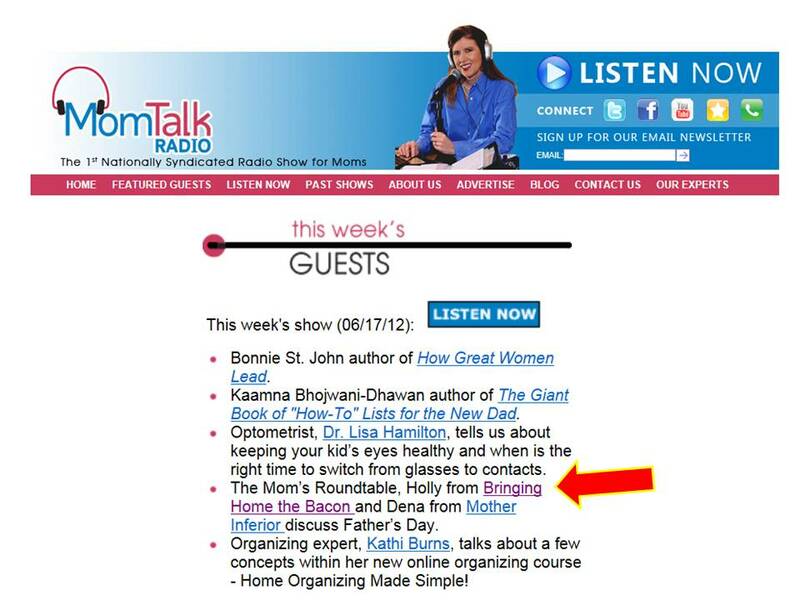 She has a great mix of experts on relevant topics for families. The day/time of the taping I got a call from a male producer who basically dumped me directly on the line with Maria. But just like when you go on Oprah (I would assume.) there is no time for idle chit-chat. In about five seconds the other Mom was on the line and it was time to put on the RADIO VOICE. And Maria has a very nice radio voice (her regular voice is nice too). The actual interview was fun. We talked about our plans for Father's Day--both me and the other Mom not really realizing that we should be talking as if Father's Day was THAT DAY. 1. She has seen my blog before. WHAT?? 2. She now gets the whole Bringing Home the Bacon name. She gets it! Be sure to listen to the show--and consider tuning in regularly. If you are pressed for time, my part is about 3/4 of the way through. Of course, show business is fickle. Immediately after our interview wrapped and Maria taped her next promo the call ended. No goodbyes or empty promises to keep in touch, no offers to hang out. Just a dial tone, like Oprah.